Rev. Samuel Rodriguez is the President of the National Hispanic Christian Leadership Conference, the organization recognized and identified by Time Magazine, New York Times, The Wall Street Journal, Christianity Today, Charisma Magazine, NBC, Telemundo, Univision, Fox News, CNN, and a number of additional media outlets, publications, and periodicals as America’s largest and most influental Hispanic/Latino Christian organization with 40,118 certified member churches in the United States and in covenant relationship with ministries and churches in Latin America. Rodriguez was also prominently featured in the April 15, 2013 TIME cover story, The Latino Reformation. 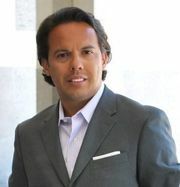 Additionally, a number of outlets have deemed Rodriguez as one of America’s leading Christian and Latino voices and as the leader of the Latino Evangelical movement, including CNN, Fox, NBC Telemundo, The Wall Street Journal, The San Francisco Chronicle and Charisma Magazine, to name a few. In January 2013, he was the first Latino to ever be invited to deliver the keynote address at The Martin Luther King, Jr. 40th Anniversary Commemorative Service at Ebenezer Baptist Church in Atlanta, Georgia. Rodriguez has been invited to give keynote speeches at a variety of gatherings including The Ethics and Public Policy Center’s 2013 National Religious Freedom Conference in Washington, D.C., as well as at The White House, Princeton, Yale, Promise Keepers, The National Association of Evangelicals and Liberty University. A representative of President Obama’s White House Task Force on Fatherhood and Healthy Families, he frequently meets and consults members of both parties in Congress and in White House meetings on social justice, Latino and values issues and provided consultation to a number of 2016 presidential campaigns on issues such as religious liberties. Rodriguez is the recipient of the Martin Luther King Jr. Leadership Award presented by the Congress of Racial Equality; the 2015 Rosa Parks Courage Award given by the Montgomery Improvement Association (MIA) and the Southern Youth Leadership Development Institute (SYLDI); and the “Defender of the Dream” award presented in 2016 by Alveda King and the King Family as well as Bishop Harry Jackson of The Reconciled Church. Rodriguez is regularly featured, profiled and quoted by The Washington Post, CNN, Fox News, NBC Telemundo, ABC, NPR, Chicago Tribune, Christianity Today, Newsweek, Univision, The New York Times, The Wall St. Journal, CNN Español, Bill Moyers, Boston Globe, The Atlanta Constitution, Ministry Today, The Christian Post, Charisma, CBN, TBN and many others. An award-winning author, Rodriguez contributes to world-renowned publications such as The Washington Post, The Huffington Post, Outreach magazine, Ministry Today, Enrichment Journal, Vida Cristiana, Christianity Today, Yale “Reflections” and others. He is also the author of “Be Light: Shining God’s Beauty, Truth, and Hope in a Darkened World,” which made #1 on the LA Times Best Seller’s list, “The Lamb’s Agenda” and “Path of Miracles” (2009). Rodriguez currently serves on the Board of Directors of some of America’s leading Evangelical organizations such as Gordon Conwell Theological Seminary, National Association of Evangelicals, Empowered21, PCCNA and Christianity Today. He earned his Master’s degree in educational leadership from Lehigh University and likewise received Honorary Doctorates from Baptist University of the Americas and Northwest University. He is an Assemblies of God Ordained Minister since the age of 23. Rodriguez also serves as Senior Pastor of New Season Christian Worship Center in Sacramento, California, where he resides with his wife, Eva, and their three children. Rodriguez serves as the President of the Executive Board of the National Hispanic Christian Leadership Conference as of March 16, 2010. 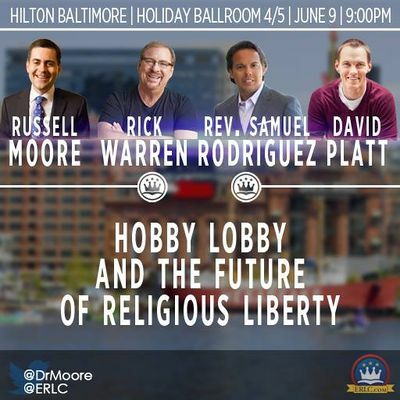 June 9 2014 Russell Moore, Rick Warren, Samuel Rodriguez, David Platt served on a panel at the Hilton Baltimore "Hobby Lobby and the future of Religious liberty". Samuel Rodriguez signed a letter to President Trump written by World Relief. titled "Top evangelical leaders and pastors from all 50 states urge action to help vulnerable immigrants" which lamented a decrease in refugees entering the United States, and requested amnesty for DACA recipients. "As Christian leaders, we have a commitment to caring for the vulnerable in our churches while also supporting just, compassionate and welcoming policies toward refugees and other immigrants. The Bible speaks clearly and repeatedly to God’s love and concern for the vulnerable, and also challenges us to think beyond our nationality, ethnicity or religion when loving our neighbor. "Dreamers. Roughly 700,000 young people are poised to lose their right to work lawfully in the U.S., not to mention their dreams of a future in this country—the country they were brought to as children, without choice. Our prayer is that these young people would be allowed to continue contributing to our society without fear of deportation. "Refugees. We are troubled by the dramatic reduction in arrivals of refugees to the United States, which declined from 96,874 in 2016 to just 33,368 in 2017. Based on arrivals so far in this fiscal year, the United States is on track to admit the lowest number of refugees since the formalization of the U.S. Refugee Resettlement Program in 1980. This, at a time when there are more refugees in the world than ever before in recorded history. Our prayer is that the U.S. would continue to be a beacon of hope for those fleeing persecution. "Persecuted Christians. Refugees of all faiths and nationalities deserve our welcome, for they (like all human beings) are made in the image of God. We are particularly aware, though, of the Christian refugees and other minorities facing persecution in countries like Iraq, Iran and Syria. Admission of Christian refugees to the U.S. from these three countries has declined by 60%. We pray that those facing religious persecution would be protected overseas as well as in the U.S.
"Families Waiting for Reunification. God ordained the family as the cornerstone of society, and we believe that our country is stronger when our citizens can be quickly reunited with their close family members. For some U.S. citizens, the waiting period can be years or even decades. We pray you will respect the unity of the family. "We are mindful of the difficulty of serving in public office and are grateful for your service. We ask that God would grant you wisdom and courage as you confront these and various other complex policy issues in the days and months ahead. Signatories included Samuel Rodriguez, National Hispanic Christian Leadership Conference. This page was last modified on 25 November 2018, at 00:37.